Size:S _ Bust:24cm _ Length:24cm// Size:M _ Bust:32cm _ Length:29cm// Size:L _ Bust:38cm _ Length:36cm// Size:XL _ Bust:54cm _ Length:50cm.  If any of the measurements are between two sizes, choose the larger one. Please allow color difference due to lighting effects, monitor settings, etc.  You will be willing to take many many photos with your pets, and post on your page. Made of polyester and non-woven fabric, soft and breathable. 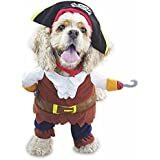 This cool pirate costume design turns your pet into a humoristic caribbean pirate. Its worth it for the laughs! Makes a great gift for the holidays and for entertainment. Note: Please measure your dog carefully and refer to our size chart before you place a order for it. If your dog's measurements fall between two sizes, please select the larger size. 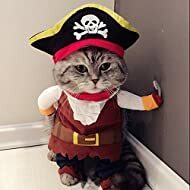 Idepet(TM) New Funny Pet Clothes Caribbean Pirate Dog Cat Costume Suit Corsair Dressing up Party Apparel Clothing for Cat Dog Plus Hat Size information: Size S:Length_21cm/8.3'';Neck_30cm/11.8'';Cap_34cm/13.4'' Size M:Length_32cm/12.6'';Neck_32cm/12.6'' ;Cap_48cm/18.9'' Size L:Length_45cm/17.7'';Neck_40cm/15.74'' ;Cap_58cm/22.8'' Size XL:Length_51cm/20'';Neck_54cm/21.2'';Cap_78cm/30.7'' Please choose size carefully *Measuring Your Dog for a Perfect Fit* 1.How to measure your dog? There is a picture to show how to measure your dog above,please check it. 2.Your baby usually wears size S doesn't mean all size S will fit him/her,please check the size information carefully before you buy. You looked at one size chart and found that your dog is a size small. But that doesn't mean he/she is a size small for all the clothes. Different designers and manufacturers use their own size charts. So the measurements given in a size SMALL by manufacturer "A" will be a size XS in manufacturer B's size chart. Don't buy a particular size because that is what you always buy in a pet shop or online store. Always look at the size chart for chest girth and length and confirm the size before you commit to buy. 3.If any of the measurements are 'between' two sizes, choose the larger size. 4.If your pet dog is growing up,you can order a bigger size 5.Take each measurement a bit loosely. Take each measurement a bit loosely, so there will be room for your dog to move and breathe, but not too loose. Please measure carefully before buying and email us if you have any questions about fit before you bid or make a purchase. 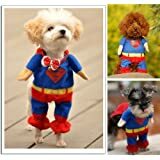 I laughed for five minutes straight watching my Cocker Spaniel prance around in this costume! It is adorable. It is reasonably well-made, a few loose strings and a rough edge here and there, but for the price, I'm not complaining. Easy on and easy off. My little critter looked so cute in her custome! It was a tad large around the neck since she's a smaller cat but overall super cute costume! 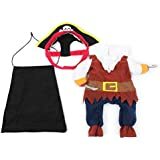 The pirate arms are awesome! 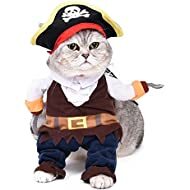 I gave it 5 stars for the laugh it gave me when I looked at this page and I did think about buying it but then I looked at my female/lady cat, she's a proper little madam, and I could envision her ripping it to shreds the moment I put it on her.